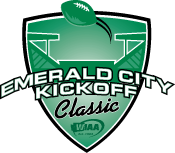 The WIAA announced the matchups for the 2017 WIAA Emerald City Kickoff Classic (ECKC) to be hosted at Husky Stadium on the University of Washington Campus, Saturday, Sept. 2. The eight participating teams in the 14th edition of the event will be: Eastside Catholic, Fife, Gonzaga Prep, Kennedy Catholic, Lincoln, O’Dea, Pullman and Seattle Prep. The event will consist of four in-state matchups beginning at 10 a.m. The first matchup of the day will feature Pullman, which qualified for the first round of the WIAA State Playoffs in 2016, and Fife which will make its second appearance in the Kickoff Classic after debuting in 2008 against Cascade Christian. The second contest will pit Kennedy Catholic against Seattle Prep in a battle between two local teams. Kennedy Catholic was knocked out of the 2015 WIAA Playoffs by eventual champion Bellevue, and was a participant in the second annual ECKC in 2004, defeating Tahoma. Seattle Prep will make its third appearance in the event after winning against Mercer Island in 2011 and falling to Roosevelt in 2013. The 4 p.m. game will include a pair of teams that met in the 2016 3A State Playoffs in O’Dea and Lincoln. O’Dea emerged victorious in the quarterfinal meeting, edging out a 28-20 win before advancing to the State finals and falling in an overtime thriller against Kamiakin. Lincoln is coming off back-to-back state appearances and will look to kick off their season in a big way over the holiday weekend. The evening finale will feature a pair of state powerhouses in Gonzaga Prep and Eastside Catholic. Gonzaga Prep is one of the most decorated programs in the 4A division, with 19 state appearances and three WIAA Championships. Eastside Catholic has qualified to 14 playoff appearances and owns two State Championships at the 3A level. Both schools have one previous win in their lone appearance in the Kickoff Classic. Tickets for the event are $15 for adults and $10 for students (with valid ASB card), and seniors. Children under the age of five are free. More information regarding the event and its history can be found on WIAA.com. In addition to the Emerald City Kickoff Classic, the WIAA will host the Emerald City Volleyball Invitational at Mercer Island High School over the holiday weekend on Friday, Sept. 1. The four-team jamboree will include Cleveland, Lynden Christian, Mercer Island and Seattle Prep. Admission to the Volleyball Invitational is free of charge. Detailed information about the ECVI can be found here. Tickets can also be purchased through paticipating schools OR at the gate the day of the event. All tickets are general admission and are valid for all four games. A portion of ticket proceeds go to participating teams.